More than four decades after the end of the Vietnam War, the United States and Vietnam are just beginning to address the negative consequences of Agent Orange, the dioxin-contaminated herbicide used during the war. 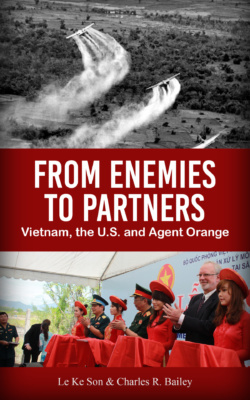 In this groundbreaking book, titled “From Enemies to Partners: Vietnam, the U.S. and Agent Orange,” two leading experts on Agent Orange and its aftermath explore current scientific understandings of the chemical and consider the promising solutions to addressing the consequences of its use. The authors, Le Ke Son and Charles R. Bailey, outline the moral reasoning for a fuller American response and present further steps the United States and Vietnam can each take in a joint humanitarian initiative to resolve the legacy of Agent Orange/dioxin in Vietnam. They address the critical issues of whether dioxin pollution still exists in Vietnam, what needs to be done to finish the job of cleanup, how many victims of Agent Orange carry out their lives today, and the impact of Agent Orange on relations between the United States and Vietnam. Chapter 1. Is there still dioxin pollution in southern Vietnam? Chapter 2. Who has been exposed to Agent Orange/dioxin and how many victims of Agent Orange are there in Vietnam? Chapter 3. Does dioxin exposure lead to birth defects and reproductive failure? Chapter 4. Has the forest ecology recovered from the spraying of Agent Orange? Chapter 5. What do Americans know about Agent Orange? Chapter 6. What is Vietnam doing for the victims of Agent Orange? Chapter 7. What has the United States done so far? Chapter 8. What do Agent Orange victims need? Chapter 9. Can the Agent Orange issue be resolved through the courts in the United States or elsewhere? Chapter 10. How has the bilateral relation on Agent Orange changed over time and what is the situation today?